We are kicking off the 50th anniversary celebrations of Guild Books’s beginning. When, you ask? Sunday, May 21, 2017! 2 to 4 pm! Come, celebrate the vitality of independent literature and appraise how literature continues to contribute to social transformation at a time so different from when Guild began. “I consider the birthday of the Guild to be May 21, 1967, for that is the day we signed the lease and paid the first month’s rent of $60 for the storefront at 2136 N Halsted.” So wrote Robbye Lee in a letter to Richard Bray, who had bought the bookstore in 1979. In 1987 Lew Rosenbaum came to Chicago to help manage the store. And in 1993 the store closed. Panelists will include Eric Yankee, Jo Ann Capalbo, Carolos Cumpian, Juan Carlos Perez, and Diana Berek, moderated by who else? Lew Rosenbaum of course! This event is free and open to the public, and we sure hope you can join us to kick off the celebrations of Guild Books’ 50th anniversary. 1138 W Lunt @ Sheridan in the basement, down the stairs at the south end of the building. 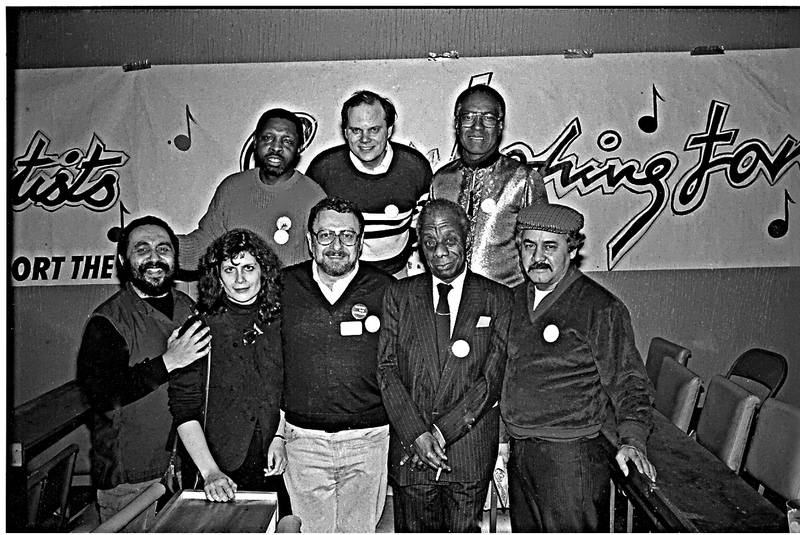 Yes that is James Baldwin at Guild Books: photo copyright, Steven Gross 1987, Artists for Washington celebration with (left to right in the front row) David Hernandez, Carol Becker, Richard Bray, James Baldwin, Jose Gonzalez, and Phil Cohran behind Jose Gonzalez.